Family members of missing Babine Forest Products employee Carl Charlie gather at the Margaret Patrick Memorial Hall. Family, friends and concerned community members have been flooding into Lake Babine Nation’s Margaret Patrick Memorial Hall since news of the Babine Forest Products mill explosion. Lake Babine Nation Chief Wilf Adam said to Lakes District News the Margaret Patrick Hall will remain open until things have calmed down. “The hall has been open since 9 p.m. last night and we have grief councillors on hand. Our members are also helping each other get through this sad time,” Chief Adam said. According to Chief Adam, once the fire stops burning at the mill, the search will continue for two missing men. 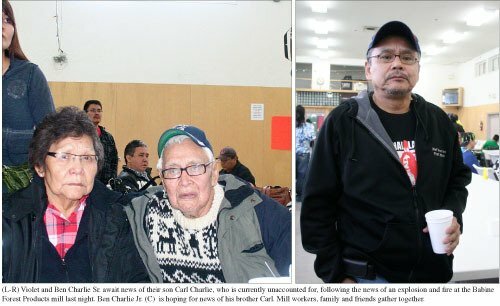 He said, “One of the employees is Stellat’en but lives at the Wet’suwet’en village and the other, Carl Charlie is from Lake Babine Nation. “We do not want to say anything other than they are missing … they are just missing,” said Chief Adam. Ben Charlie Jr. brother of Carl Charlie said to Lakes Distirct News that he is completely devastaed that this has happened. He also said a number of Lake Babine Nation members are in critical condition, with Kenny Michell being the most affected by the tragedy. Steven Dominic has been flown to the University Hospital of Alberta Burn Unit and Derek MacDonald is currently at the University Hospital in Prince George, but Chief Adam said he is due to be transported to the University Hospital of Alberta Burn Unit for further treatment. John Bertacco, Lake Babine Nation councillor said his eldest son Blaine was working at the mill at the time of the explosion. Kenny Michell arrived at the hospital in an ambulance while he was helping out. “Kenny was completely burnt … his face and hair … I couldn’t recognize him,” Bertacco said. “The second person they brought in was also severely burnt and he had a big patch over his left eye …. we didn’t recognize them,” he added, struggling to hold back tears. Six grief councillors are on site at the Margaret Patrick Memorial Hall, as well as a number of level three first aid people. “We will be here 24/7,” Chief Adam said. Hundreds of comments from people have flooded in from all over, sendng in their support for the community.